Oleksandr is currently a research fellow at INL working on intracellular temperature measurements using luminescence nanothermometry for hyperthermia treatment. 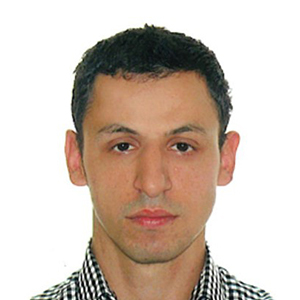 He has a Master degree in physics of semiconductors and nanostructures at Chernivtsi National University, Ukraine. His master thesis focused on synthesis of ZnO nanoparticles by pulsed laser ablation technique in liquid media. In 2016, he finished Ph.D in Science and Chemical Technology from University Rovira i Virgili, Tarragona, Spain. During his Ph.D studies he was working on development of new materials and techniques for luminescence nanothermometry. A. Savchuk, P. Haro-Gonzalez, J.J. Carvajal, D. Jaque, J. Massons, M. Aguilo, F. Diaz. Er:Yb:NaY2F5O up-converting nanoparticles for sub-tissue fluorescence lifetime thermal sensing. O. A. Savchuk, J. J. Carvajal, M. C. Pujol, E. W. Barrera, J. Massons, M. Aguilo, and F. Diaz. Ho,Yb:KLu(WO4)2 nanoparticle a versatile material for multiple thermal sensing purposes by luminescent thermometry. J. Phys. Chem. C 2015, 119, 18546. Ol. A. Savchuk, J. J. Carvajal, J. Massons, M. Aguiló, F. Díaz. Determination of photothermal conversion efficiency of graphene and graphene oxide through an integrating sphere method. Ol. A. Savchuk, J. J. Carvajal, C. Cascales, M. Aguiló, F. Díaz. ACS Appl. Mater. Interfaces 2016, 8, 7266.